Note from Mary: As you know I’m not one of the Bible’s writers, although my story appears in several of the Gospels. What follows is a re-telling of my experience with some extra tidbits thrown in that, while historically accurate, may be new to you. Merry Christmas. There was an expectancy you could almost feel in Israel in those days, and sometimes it exploded into the streets as one itinerant preacher after another toured the country delivering his Messianic messages. Some actually claimed to be the Messiah, while others loudly hailed His coming, warning everyone to get ready. Usually it got them in trouble with the law, since the thing the Romans hated most of all was civil unrest. Some were beaten and run out of various towns and a few were put to death. But the people caught the Messianic fever, hoping, dreaming and even praying that the Lord would raise up a leader to defeat the Romans and restore our country to its glorious days of the past. Those who took our Scriptures literally knew from reading the prophet Daniel that the time had about come for the promised Messiah’s arrival. Back in the year you call 586 BC the Babylonians had destroyed Jerusalem, leaving the whole area in ruins as they carried all our people off to a life of slavery. One of those people was Daniel, and while he was in Babylon the Lord told him that after 70 years the Persians would conquer Babylon and the Jews would be set free to return and rebuild everything. And then He told Daniel that 483 years after they received permission to rebuild Jerusalem, the Messiah would come. The Persian King issued the official decree authorizing them to begin on a date you know as March 14, 445BC. As a teenage girl in Nazareth, I had lots of other things on my mind, too. Let’s not forget that I was engaged to be married! My betrothed was a carpenter named Joseph. He had a shop in town and made furniture and things for the people of Nazareth. In his spare time he was building the house we were going to live in. Let me take a minute to explain that in those days things were a lot different from the way they are in your time. It took years for men to establish themselves sufficiently to be able to support a wife and family, but when they did they often chose younger women who were strong enough to bear and raise lots of children. And so it was with Joseph. Since he was quite a bit older than me I didn’t know him at all, but he had apparently taken a liking to me because one day he showed up at our house to ask for my hand in marriage. This meant that my family would be deprived of my help in keeping our household functioning, so my father needed to be adequately compensated for his loss. After a long session of negotiating a proper price for me while my mother and I sat there watching, Joseph and my father reached an agreement and all eyes turned to me. I had about thirty seconds to agree or disagree to the arrangement. If I disagreed Joseph would leave and I would never see him again. If I agreed there would be a legally binding betrothal ceremony, and a series of closely chaperoned “get acquainted” meetings would be scheduled. We would never be alone together until our wedding night, which would take place only after Joseph’s father determined that the house he was building for us was finished and suitable. This often took still more years. Things moved a lot more slowly then, but in my case an event unique in all of human history would alter our time table considerably. “I am the Lord’s servant,” I said. “May it be to me as you have said.” Then the angel left me. Well what do you say after a conversation like that? I was stunned! Speechless! And anyway who could I tell? There was only one person in the world who might have even an inkling of what I was going through; my cousin Elizabeth. Though much older than I, she was just now experiencing a very similar shock. Having been barren all her life, a huge embarrassment for a woman in my time, she was going to have a baby, too. And it was also the Lord’s doing. I had to go and visit her, even though it was several days journey in a time when travel was a major undertaking. Looking back on that time, and with the benefit of New Testament Scriptures, I’m always taken with the similarity between the way my betrothal and wedding to Joseph should have gone and the relationship between the Church and the Messiah. I now believe the Lord set up these traditions just to teach us things about Himself. I didn’t know Joseph was coming into my life till the day he first arrived to ask for my hand. He and my father agreed on the price for me, and though it was all arranged by them, I had to choose for myself to confirm the agreement. When I did, I became his and no one could steal me away. Under normal circumstances he would then have gone away and I would rarely see him till he came like a thief in the night to carry me off to our wedding at his father’s house. The wedding date would have been unknown to me, because it couldn’t happen till his father agreed that the house he was building for me was complete. During the intervening time I would have had to watch and wait, always ready to go, because I wouldn’t have known the day or the hour of his return. I would spend a lot of time learning about him from his friends and preparing for our life together. When the wedding day finally came, the festivities would last for seven days and during that time we would be hidden away at his father’s house. At the end of the seven days we would return together to the house he had built for me and begin our new life. In the same way, most believers are not expecting Him when the Lord first shows up in their lives. Though He and His Father have agreed on a price for us (his life’s blood) we have to choose for ourselves to confirm the arrangement. But when we do we become His and no one can steal us away. We never meet Him till he comes like a thief in the night to carry us off to His Father’s house for our wedding. That day will be a surprise to us, known only to His Father. In the meantime we watch and wait, always ready to go, because we don’t know the day or hour of his return, learning about Him from His friends while we wait. When the day finally comes we’ll be whisked away to His father’s house for seven years of festivities, after which we’ll return with Him to begin our new life as His Bride in the mansion He’s spent the last 2000 years building for us. When I told Joseph about my condition, he was greatly troubled. You see, being pregnant out of wedlock was a very serious offense against our law. Joseph had every right to bring me before the priests and accuse me of sexual promiscuity, a crime punishable by death. Even if they let me live, my life would be ruined! An unmarried girl was supposed to remain a virgin and no self-respecting man would take a bride who wasn’t. And in those days there was no such thing as a single mom. What would I do? I guess he had already begun falling for me, and while he couldn’t overlook what he thought was my infidelity, he decided that he would just break our engagement quietly, and we could go our separate ways. I could tell he was heart broken, and so was I. I couldn’t really blame him though. It was an outrageous story. 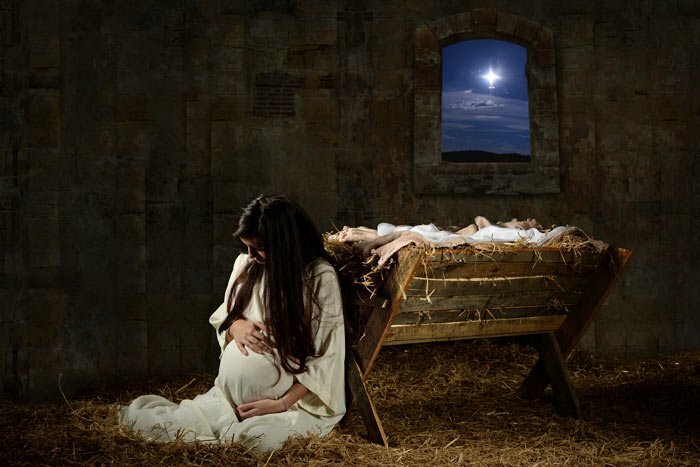 Never before in history had a virgin become pregnant! But while I was visiting Elizabeth an angel came to him in a dream and told him everything was just as I had said and it was OK to remain with me. What a relief! Next time: delivering the One Who would soon deliver me.